You either love ’em or you hate ’em. 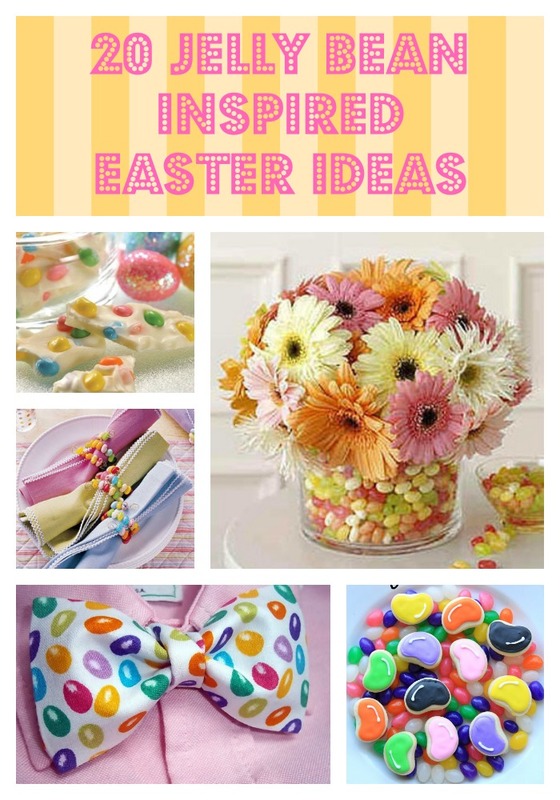 If you happen to be a lover of jelly beans, I’ve got 20 wonderful jelly bean ideas for Easter. 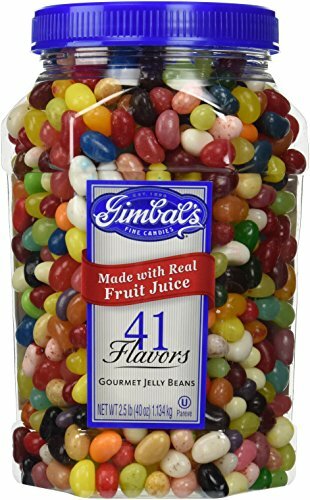 Hidden in plastic eggs or a topping on a sweet treat, I just love jelly beans. Well, except for those pesky black ones. Who likes those black jelly beans anyway? This iconic Easter candy has inspired some amazing treats and ways to celebrate Easter. 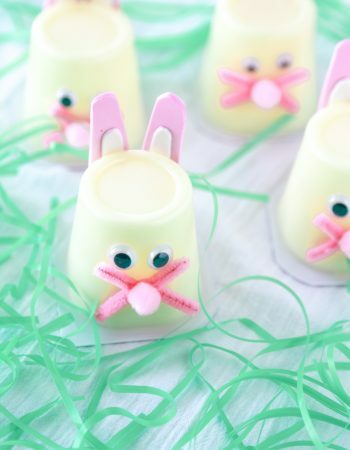 Here are 20 of my favorite Jelly Bean ideas for Easter. 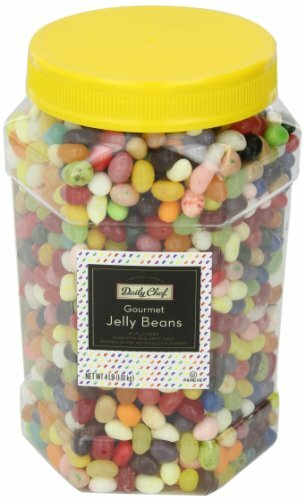 Stock Up & Save: If you plan on doing any of these Jelly Bean ideas for Easter, you’ll need JELLY BEANS! Save yourself a trip to the store and order quickly and easily on Amazon. If you’re not already a member of Amazon Prime, try it out free. 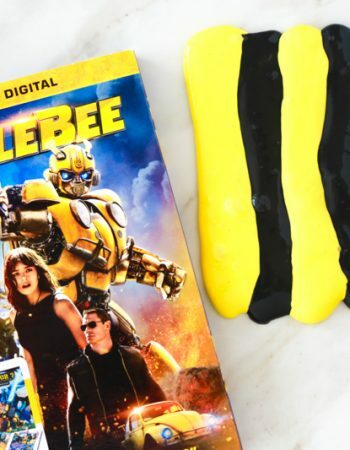 Get a FREE 30-DAY AMAZON PRIME TRIAL. Jelly Bean-Shaped Cookies // These delicate sugar cookies are paying tribute to the humble jelly bean. These cookies are just way too cute! Jelly Bean Bark // This colorful candy bark features just three ingredients. I guess you can figure out one of the ingredients. Jelly Bean Pop Tarts // I love jelly beans and I love pop tarts. So these Jelly Bean Pop Tarts are a double win. Jelly Belly Flower Cake // Sweet flowers made from jelly beans make this an Easter cake you won’t forget. Isn’t this cake just perfect for spring? Jelly Bean Bird Cookies // Graham crackers are topped with jelly bean birds on a wire to create an absolutely gorgeous cookie. Almost too pretty to eat. Almost. Jelly Bean Cookies // Forget the chocolate chips and use jelly beans in your favorite recipe instead. Turn your otherwise boring cookies into a colorful creation perfect for spring. Jelly Bean Flower Cupcakes // See what’s sprouting atop these adorable cupcakes. I love how they used the Jelly Beans in this creative recipe. Bacon Flavored Jelly Beans // Because dads need candy, too. And, bacon. I don’t need to write anything else. Cookie Easter Baskets // Make chocolate chip cookie Easter baskets to hold your favorite candies. 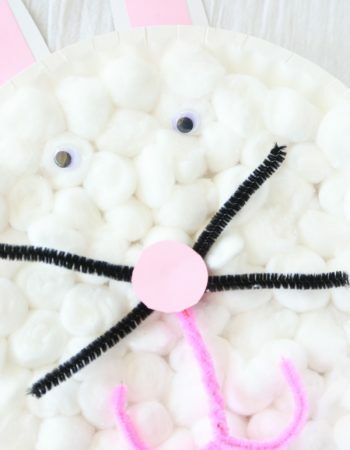 I love all these Jelly Beans ideas for Easter, but this one may take the cake. I love how they used cookie dough and Twizzlers to make an Easter basket. White Chocolate Peeps on a Stick // Jelly beans serve as colorful tails for these yummy white chocolate bunnies. I can’t think of another candy that serves this purpose better. Spring Cookie Pizza // If this candy-topped “pizza” were available for delivery, I’d never leave home. With toppings like marshmallows and Jelly Beans, why would you ever order anything else? Jelly Bean Front Door Monogram // Jelly Beans never looked better. Welcome guests with this sweet alternative to a front-door wreath. Jelly Bean Napkin Rings // Set the table with this iconic Easter candy. Create a napkin ring you can eat when you’re done with it. Jelly Bean Necklace & Bracelet // Kids will love to craft and wear their jelly beans with these adorable necklaces and bracelets. Jelly Bean Bow Tie // Even little boys will look sweet in this jelly bean bow tie. Don’t worry. No Jelly Beans were harmed in the making of this bow tie. Jelly Bean & Gerber Daisies Centerpiece // Fill your vase with your favorite Jelly Beans to make this gorgeous, one-of-a-kind centerpiece. Jelly Bean Topiary // Try not to eat the decorations from this gorgeous topiary made using Jelly Beans. This would make a perfect addition to the Easter decorations. Jelly Bean Chicks // These little chicks are a great preschool craft or a small gift to give around Easter. I love how the Jelly Beans are used as the belly of the chick. Jelly Bean Nail Art // Your manicure will look yummy when adorned with candy. 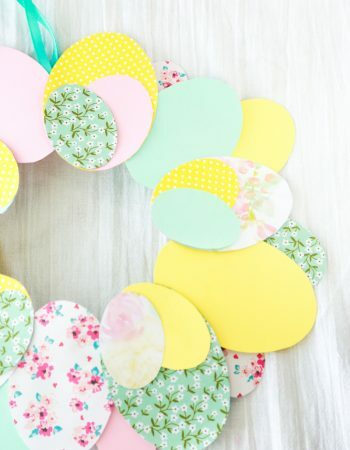 Jelly Bean Wreath // Guests will be drooling over your welcoming wreath. This Jelly Bean wreath will look adorable on your front door. Whether you’re snacking on them or decorating with them, I know you’ll be inspired by these sugary-sweet jelly bean ideas for Easter. The only trouble will be not eating them all before completion! If you sneak a few, don’t worry, I won’t tell. That is a great idea, I hate the black ones! I’ll volunteer to eat the black ones. It’s a sacrifice, but I’m willing to make it. Just none of the dark purples mixed in, please. HAHAHAHAHA I do not like Black Jelly Beans!!! Such a great list, thank you!!! 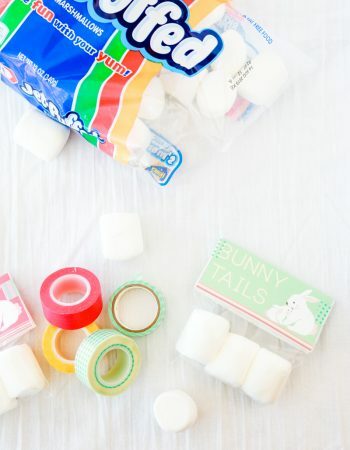 I love Easter DIY Craft Idea’s!! I do not like the black ones either, or the white. I’m a big fan of the cinnamon bag of jelly beans. My dad always buys me them:) Definitely going to check out this list! This reminds me that we need to take a tour at the local Jelly Belly factory! I wish I lived near one! Once I went to Hershey, PA & got to tour the chocolate factory. That was awesome! I love the black ones! I always have, I’m weird that way. 🙂 That centerpiece is really pretty! It sounds like I’m not alone in my dislike for them. But the jelly bean companies wouldn’t include them if no one liked them. Don’t worry, you aren’t alone! I love these ideas. So many fun crafts to do with the kids. I know my girls would be eating their jewelry if we made the jelly bean necklace & bracelet. So cute…and yummy! I like the black ones! lol. Those cookies are adorable! Oh I love this! Love Jelly Beans. Except those silly BLACK ONES! Yuck! lol. Yes, I love this!! Love Jelly Beans and Easter! I love that some card you created. I CAN’T stand the black jelly beans at all. I love all of these ideas. Those little jelly bean cookies are cute! I don’t have a bean-shaped cookie cutter, but it seems like a shape that should be pretty easy to create. Black jelly beans are not my favorite either. My mom loves them. You found lots of fun jelly bean ideas! What great ideas! And black jelly beans get a bad name I LOVE them. Haha! Sorry! I knew that they must have some fans, otherwise they would have had disappeared like the tan M&Ms. So many fun and easy ways to use Jelly Beans. Not to mention how festive they look. The jelly bean napkin holder is so stinkin’ cute! These are such a great round up of ideas. 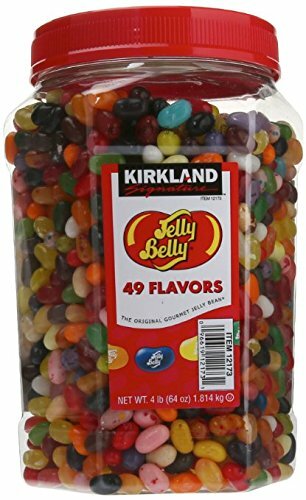 I love jelly beans too, especially the black ones! My mom LOVES the Black Jelly Beans. Ew! I really like that vase – we don’t eat very many so that would be a great way to have them out on display! I bet you could put a smaller vase inside the larger one and just fill in the gap. That way you would use less jelly beans (more for me!!!). What cute ideas! I love jellybeans too. Those napkin rings are so cute! Love the jellybean shaped cookies, those I could definitely get into eating. Those are some great ideas! I totally agree with you on the black jelly beans.. yuck! Those napkin holders are really cute!